This page hosts Max, M4L, Reaktor, pd patches and other applications created by Trevor Henthorn and are published under a Creative Commons CC BY-NC 3.0 license. 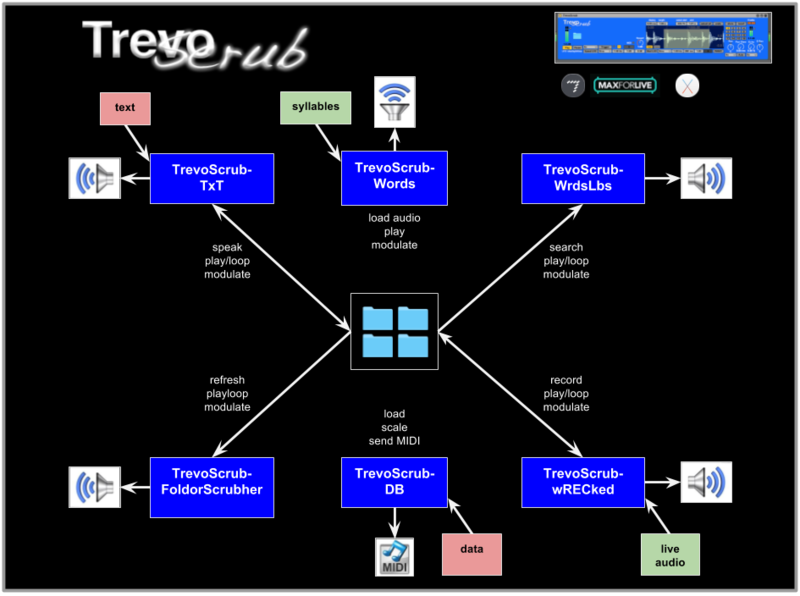 The “TrevoScrub” series is a collection of M4L patches for use in live sonification, including the Made Audible project. The name is a reminder of random characteristics that can have a profound impact. In 2007, during a registration on a new social media service, a (common) bug in the sign-up code truncated my name to “Trevor Henthor”. I kept the name and, to bring balance, I have since, intentionally, chomped the “r” from my first name. The “TrevoScrub” series combines sonification techniques, control from Push while intended, accidental and random gestures. The “TrevoCon” series provides control of functionals internal and external to Ableton Live. Combines the Mac OS X text-to-speech capabilities with MSP audio processing scrubbing to sonify text data. Current version: 0.94.7 – February 4, 2017. Free. Dynamically load and auto-choose audio playback from a folder filled with audio files. Trigger a reload of the file list via MIDI. Record live input, save and scrub loops. Trigger a reload of the file list via MIDI. Current version: 0.94.8 – February 16, 2017. Free. 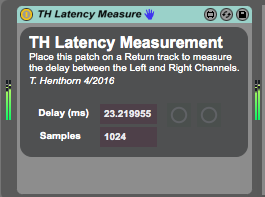 Companion plugin to browse the worlds largest standalone sample library (over 235,000 samples). Current version: 0.94.7 – February 4, 2017 – public version available soon. Scrub data from a variety of sources. Current version: 0.93 – April 24, 2016 – public version available soon. Current version: 0.94.3 – February 18, 2017 – public version available soon. With FutureCon – Mute groups of Ableton tracks. Quantize your Mutes and solos. 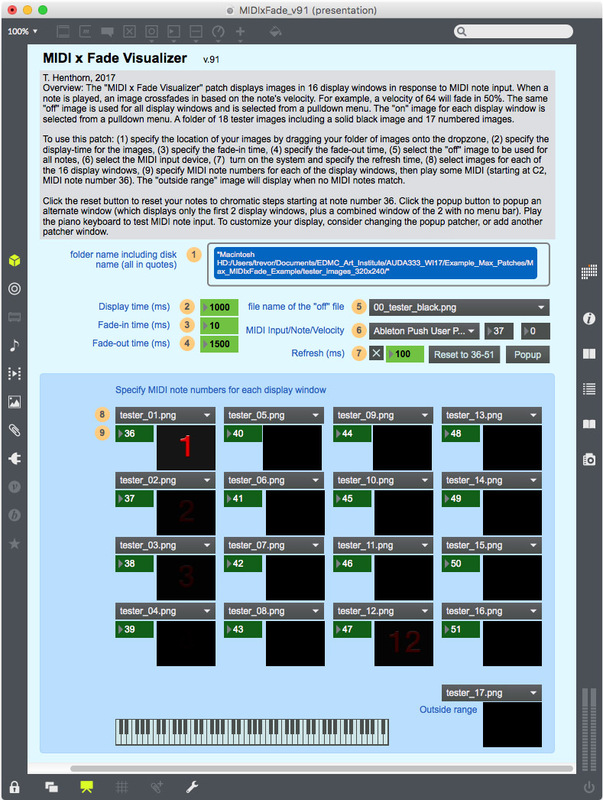 Display images in 16 display windows in response to MIDI note input. This is an example patch with tutorial-like instructions. Current version: 0.94.7 – February 4, 2017 – Free. The MIDIxMov patch shows how a playlist of movies can be displayed in a jit.pwindow based on MIDI input. Note On plays a video while Note Off pauses. Current version: 0.94.1 – February 24, 2017 – Free. 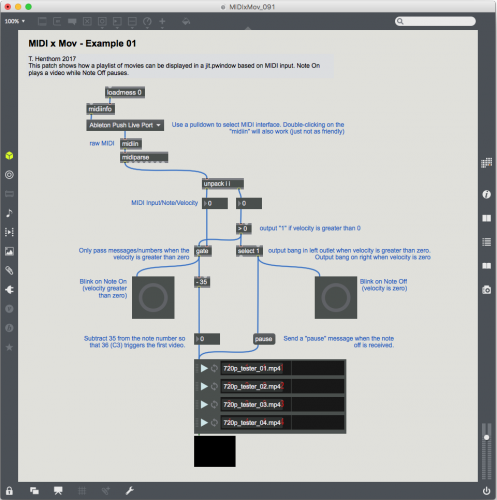 Public release coming soon – Harvest content from “the cloud” for use in Ableton Live. Recall and Patch Librarian for the Roland System-1 synth.